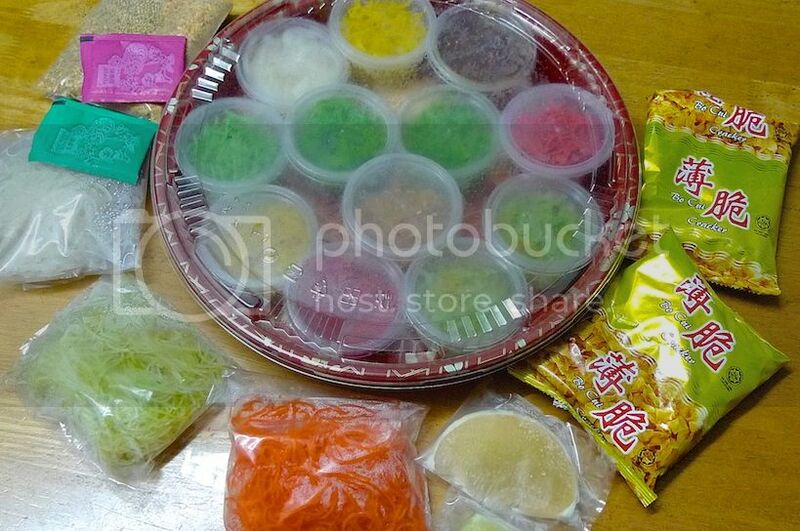 I miss the Chinese New Year holidays a lot! So please excuse me if I still blog about it now and then. 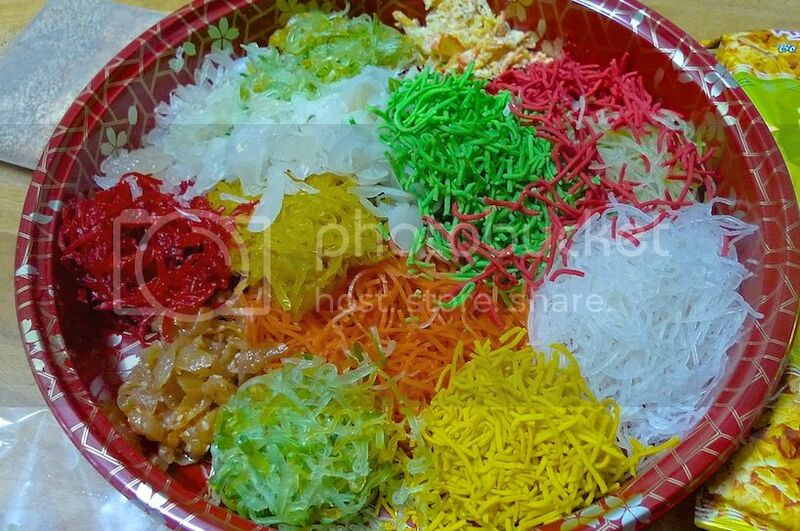 Besides the traffic-free roads, the angpows, the fireworks, and the enjoyable gathering of family members and friends, one of the things I miss most is the food, in particular, the yee sang. 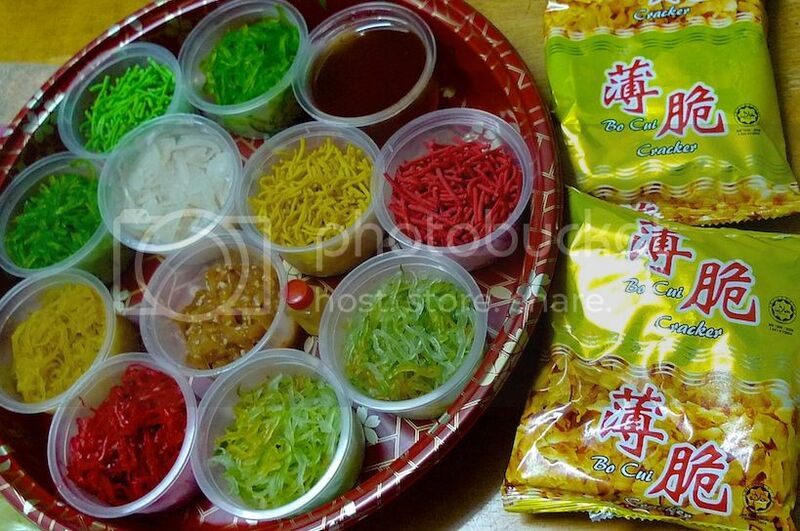 On the last day (15th day) of Chinese New Year, I bought two yee sang from Jusco Supermarket (also known as Aeon). Call me crazy, but yes I bought two! They were priced at RM48.88 each. One to be eaten on that day itself and the other the next day. 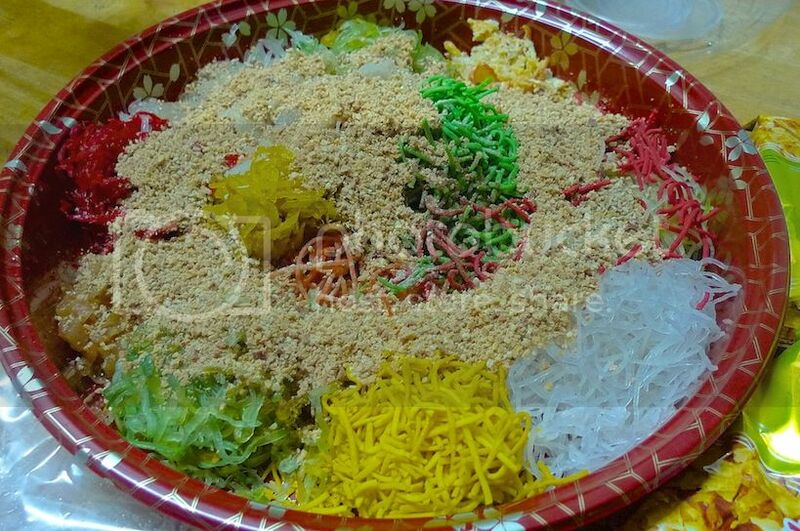 Of course, I also ate yee sang at the potluck party that evening, so it was really yee sang overload for me! LOL! 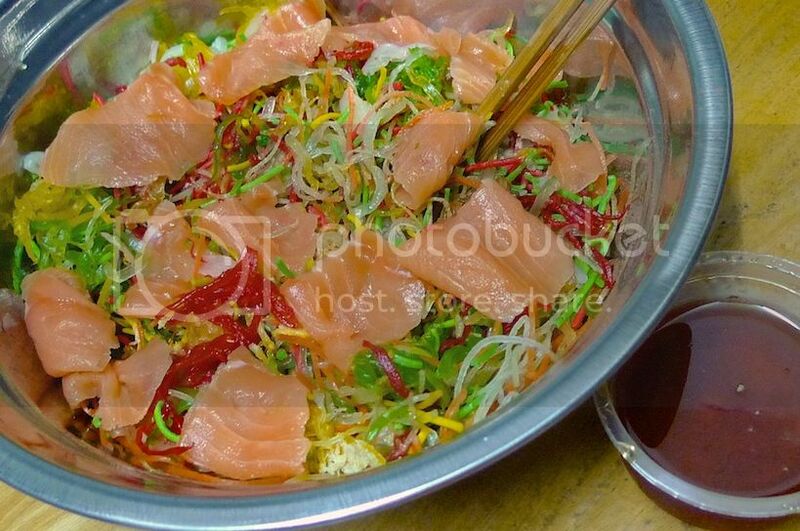 The yee sang came with fresh raw salmon. How could I possibly resist? This yee sang package from Jusco was really quite huge! I thought it was really worth the price! 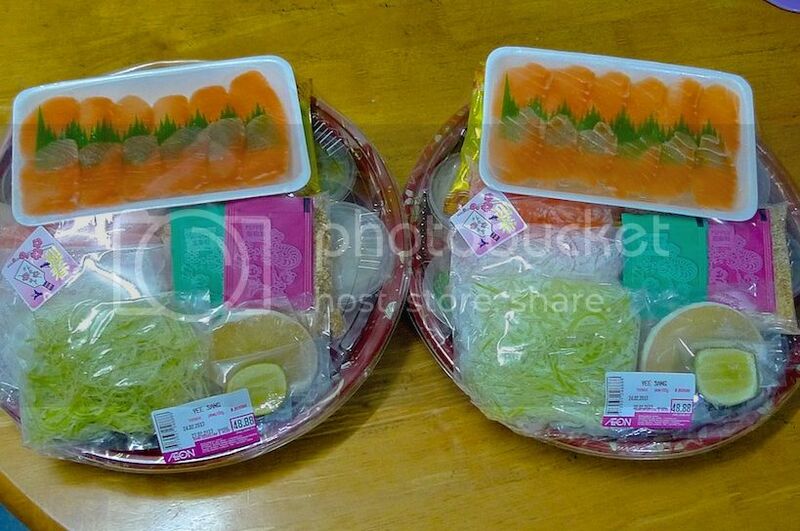 There were 12 plastic containers inside the big red plate, each containing different ingredients. 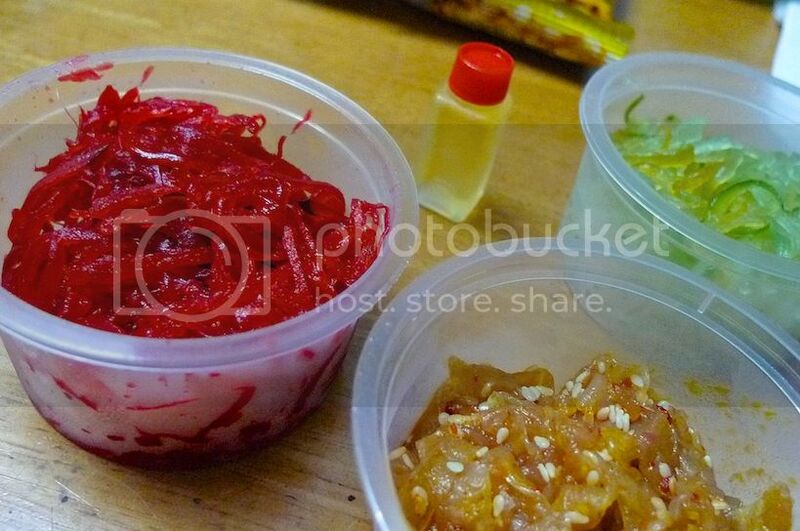 One of the containers contains sweet plum sauce. Can you also see that tiny bottle of sesame oil? Roasted sesame seeds, pomelos, carrots, spices, and other vegetables, which were not inside the plastic containers, made up the rest of the package. Oh, 2 packet of crackers were also included! I was quite impressed with the huge number of ingredients! Even the normal Chinese restaurants selling yee sang do not provide so many ingredients! 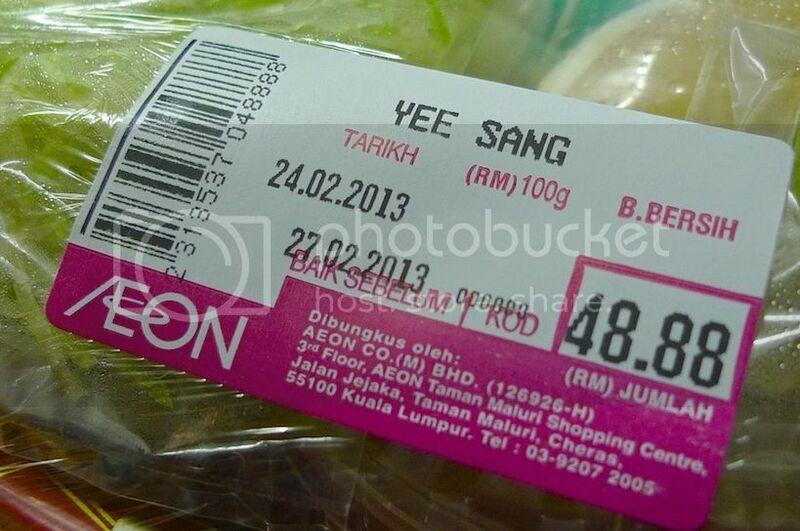 And at this price of RM48.88? Now you know why I bought two! Haha! 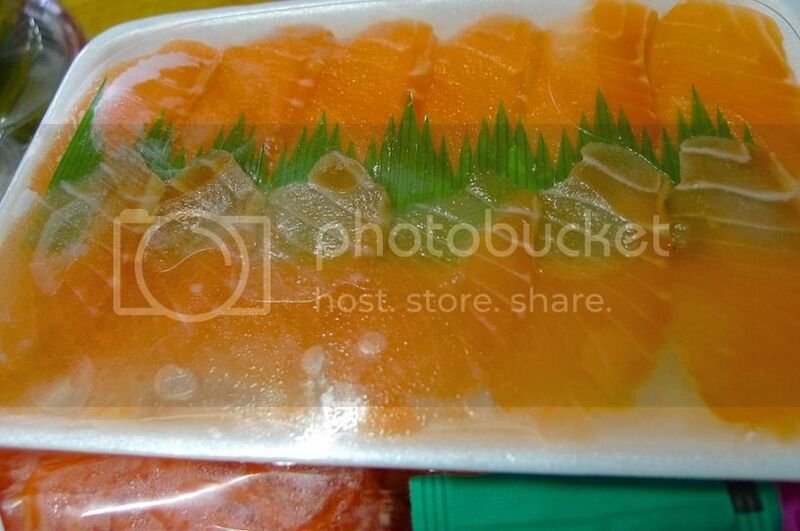 Besides salmon, jelly fish was also included. See the cute tiny bottle of sesame oil below? 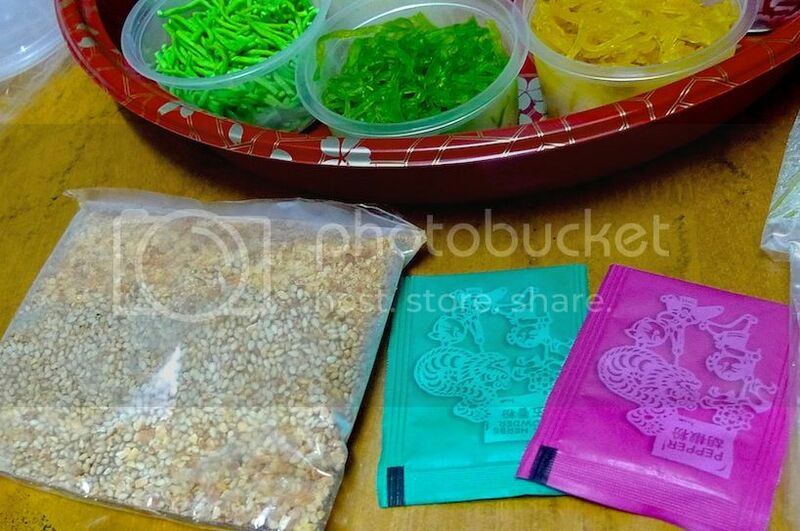 I opened up all the plastic containers and distributed the ingredients into the huge plate. The portion was huge! Possibly enough to feed 7-8 people. Or even 10 if there are small eaters among them. After adding in the roasted sesame seeds and other remaining ingredients, I poured the sweet plum sauce into the mix. Then it was time to lou sang, where everyone armed with a pair of chopsticks started to toss and mix the ingredients. 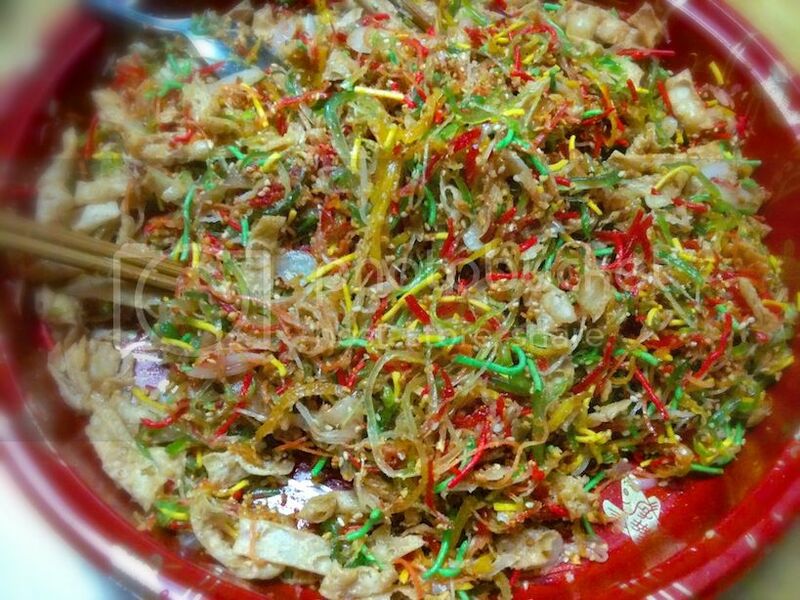 The huge plate of yee sang, all mixed and ready to be eaten. Yum! Since not every member of my family likes to eat raw salmon, only those who like it would add the salmon into their own bowls. Also, I did not pour all the plum sauce into the mix as every member of my family has different tolerance to its sweet taste. Those of us who like it sweeter could then pour in more of the plum sauce into our own bowls. Normally, I eat yee sang using chopsticks. 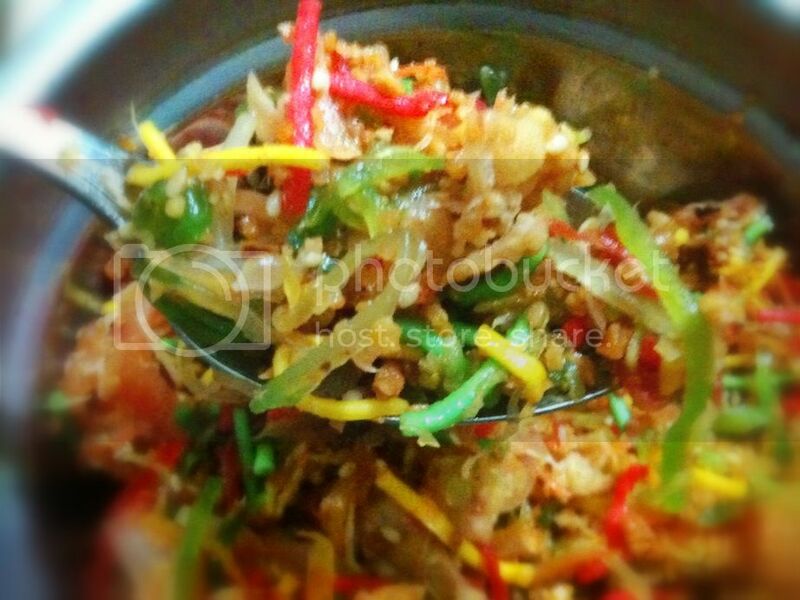 But I found a new way of eating yee sang this year, and that is, by using the spoon! Yes, and why not? LOL! Whether eaten with a pair of chopsticks or with a spoon, the yee sang was delicious! I have to say the yee sang from Jusco is one of my top favorite yee sang of 2013! 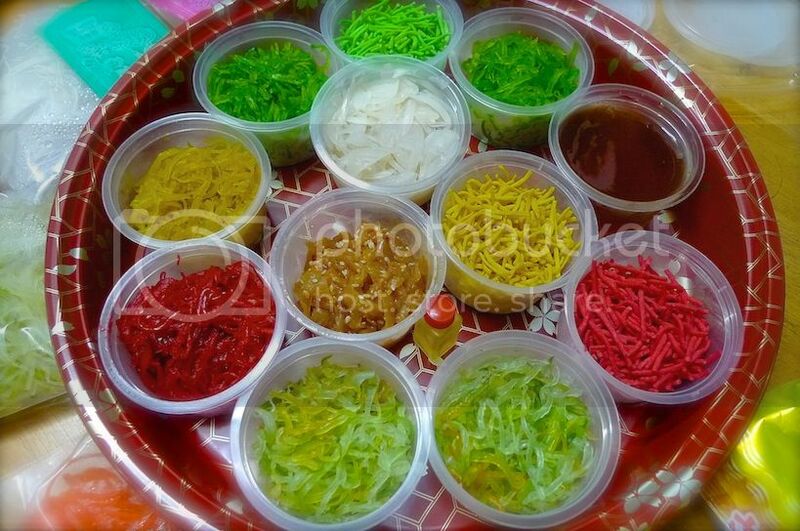 I can't wait for the Chinese New Year to come again next year so that I can make a trip to Jusco to buy their yee sang!